The graceful marquise cut solitaire diamond engagement ring not only looks larger but also adds more than a touch of elegance. A marquise cut diamond is a uniquely designed diamond shape. The graceful curves and dramatic points of this diamonds shape make it a perfect fit for diamond solitaire engagement rings. When combined with white, yellow or two tone gold it provides a stunning engagement ring. This diamond is shaped like a low pointed Oval and usually contains 56 facets. Choosing a marquise cut solitaire ring is a good choice for those who want the look of a large stone at the same price as a smaller one. This is due to the fact that the marquise often appears to be larger than its' actual carat weight. 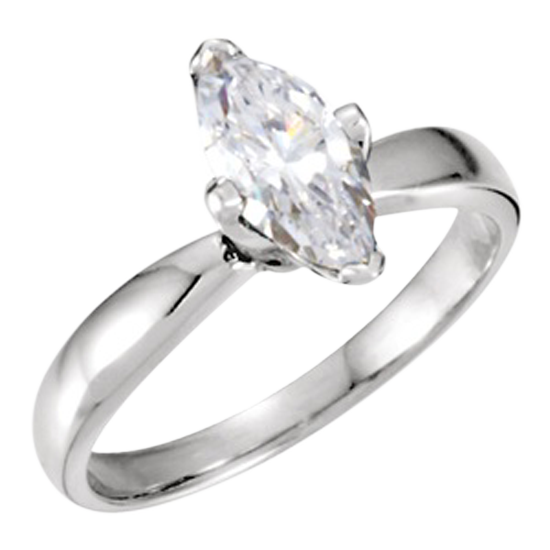 At CaratsDirect2U we have a large collection of 0.25-2.00 carat in very high clarity from VVS1 and down. For those looking for a beautiful diamond at a lower price, we also offer laser drilled marquise’s that are still as beautiful, at a fraction of the cost.